You are here: Home / Beekeeping / Aalstermethode – The Dutch Beekeeping Approach! Beekeeping on the internet is more or less focused on the american way of beekeeping. To diversify it a little. I will contribute my story . In the netherlands we have a long history of beekeeping. And in the early 1950’s, beekeepers slowly transitioned from keeping bees in skeps to the more modern hives. As human civilization is becoming more globally focused through the internet it is clear there is no international standard for beekeeping. Beehives in every culture and country has their own sizing and work method. Early beekeeping with skeps was very different than with modern hives. When honey was harvested this normally was the end of the hive. The bees were sometimes killed and the honey was broken out of the skep. Swarming was a natural method of selection and the prime swarm with the old queen was used for honey harvesting. Beekeepers wanted a younger queen’s which are more likely to survive the winter. Switching to a modular hives with removable frames was a big change. Beekeepers were able to start queen rearing, which suddenly allowed them to select and breed honey bees on specific characteristics. Another major benefit was honey production without disturbing the hive. This was a major change and the beekeeper was always ensured the bees were disturbed less. But new hives take also a new approach of beekeeping, and a major task of getting used to. The general approach for the new hives was more or less the same throughout the netherlands. But there was no standard available and it was easy to make mistakes or teach the wrong habits. In Aalst a small place in the netherlands, master beekeeper Mr. J. Evers started to documents his method. In cooperation with Mr. Ir. J.F.A.M. Mommers a beekeeping consultant of the dutch state, the method was refined and standardized. In 1953 a national article was published to help beekeepers with a standard how to approach beekeeping. This method is the standard for the Dutch Beekeeping Association and was implemented in all the starter courses. The method is called ‘Aalstermethode’, named after the place where the apiary of Mr. J. Evers is located. Till this day the beekeeping method is based on the standard work published in 1953. Some beekeepers criticize the work but it gives a good introduction in working with bees. During the beekeeping course we worked with a similar but not identical method of the ‘Aalstermethod’. The only difference was on the course we did not work with a two queen system but only with one hive. Further knowledge I got from a old beekeeper who used the ‘aalster method’ for 65 years. Unfortunately he stopped beekeeping due to his age, but he was open to give advice. He introduced me to the original two queen system and gave me more tips to refine my beekeeping. The two queen system does not mean two queens are located in one hive. But you will work with two hives which will be seen as one set. In early spring you prepare a artificial swarm by splitting the hive. The old queen is located into a six frame nuc and the other bees are kept in the prime hive, nothing special so far. The prime hive is queen less and will be used to bred new queens with supersedure cells. The prime hive and the six frame nuc can now be seen as a set. And this will not change until next year when the prime hive and the nuc are combined together to re-start the cycle to prepare a strong big hive in early spring. The main benefit is it is easy to maintain, you always have spare queens available and it is low maintenance. After making the split, the young queen is less likely to swarm and maintenance is limited to only a inspection every other week. The Aalster method is divided in several milestones during the year. The activities are described as a normal calendar year. So it differs from the –Bee cycle– which follows the honey flows. This inspection is a major milestone for every beekeeper. Timing of the spring inspection is dependent on the temperature outside and the weather. Because brood is already available you should limit the inspection time. Normally I do the spring inspection when the temperature is above 16 degrees C and the weather is sunny with a light breeze. During the spring inspection you get the chance to greet the ladies and check if they are fit enough to make a good start towards spring. very important is to check if enough food is available in the hive. It can take another few weeks before sufficient honey flow and pollen are available in nature. Further it is possible to check the health of the queen and size of the broodnest. When the spring inspection is done and the hives are healthy enough. The hives can be combined to create strong hives early in the season. When the hives are combined early in the season no extra precautions are required. You select the queen with the best characteristics and gratefully thank the other queen for her services. Combining the hives, also is a good change to exchange old hive boxes with clean ones. Take a clean bottom and hive box, hang frames with feed separate and hang frames from the brood nest from both hives alternately in the new box. When finished place the feed frames in the box below and place all the bees together in the new hive. Take the nuc and other hive parts home and clean them for future use. 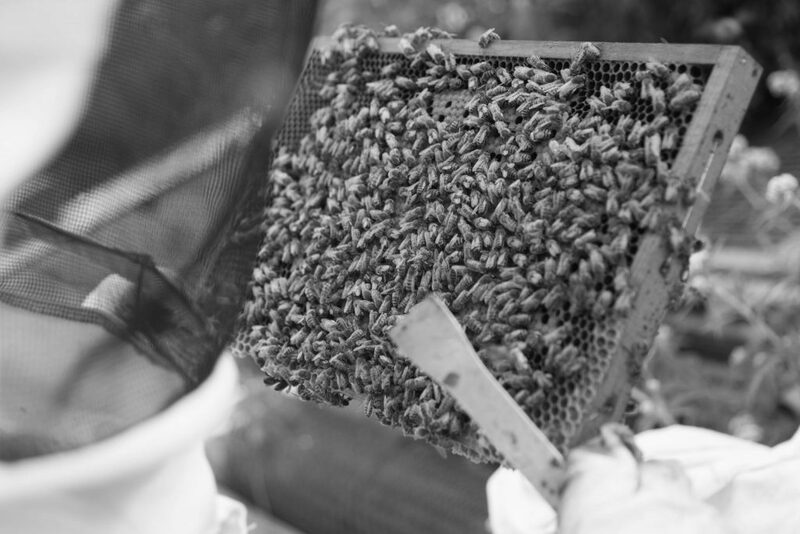 Reuniting the two hives guarantees pollution beekeepers sufficient bees to work with. Uniting the hives takes place well before the swarming season. Well in advance we can select the queen’s, which we want to work with. For a small amateur like me, this method allows me to keep my apiary a small operation. Exponential growth in your apiary will happen if you do not combine them or sell them. There is only so much time besides your social life and you want to give every hive the attention it needs. My first swarming season was quite dramatic because you end up with way too much bees, you actually have place for. So the solution can be uniting or selling a few hives. When you prefer selling your hive, some documentation should be provided to the seller, like age of the queen, size of brood and the health. When you live in a densely populated area like me, natural swarming is not preferred. This can cause quite a bunch of scared or annoyed people. The beekeeper is responsible for his bees and should minimize the nuisance. By natural swarming the amount of bee colonies become bigger, but the bee count within the colonies are reduced. By artificial swarms making the amount of bee colonies can be limited and the beekeeper can maintain hives with a sufficient size. The swarms are made roughly 4 to 5 weeks before the summer honey flow. We want to have a new egg laying queen before the summer honey flow. This increases the change good hive development and sufficient beecount to profit from the summer honey flow. For every prime hive we make one substitute, the prime hive and substitute will become one set. For one artificial swarm, a six frame nuc is required, the nuc is located next to the prime hive. Take the frame with the queen and locate it in the 6 frame nuc. In the nuc there should be one honey frame, one pollen frame, two frames with brood and two empty frames which the bees can build further. After the frames are located in the nuc, eight frames of bees will be shaken into the nuc. The foraging bees will fly back to the prime hive, so be sure sufficient bees are placed into the nuc. After a few days the artificial swarm will only contain the old bees and young worker bees who does not forage yet. The must be fed, this is done after a few days to avoid robbing. Because the old queen is removed from the prime hive, the worker bees will create supersedure cells. We must mark the 13th day after we made the artificial hive. This is the day the new queens will emerge from their queen cells.You start counting on the day you made the artificial swarm, this is day 1. On the 13th day you must break open all the queen cell available in the hive. This is important because when a cell is opened later. This can result in an after swarm and result in reduction of bees in your hive. When the cups are broken away, the queens will fight until one remains. When there are more than three queens hatching from their cells I normally pick the most vital looking ones. After the queens have fought their battle the remaining queen will undertake their propagation flight and will return to the hive to start laying eggs. It is recommended to leave the hive alone for a period of 21 days after breaking the queen cups open. This allows the queen to start without any disturbances. The new queen in the prime hive is likely to swarm in her first year. But we also have a nuc with a old queen who will swarm if we do nothing. This is the part where it is important the nuc and prime hive are located next to each other. When the nuc grows in size and the nuc becomes too small to house the bees. They are likely to prepare itself to start swarming. To avoid swarming we must reduce the amount of bees in the nuc. We want to house the excess bees in the neighbouring prime swarm. It is known that the bees are very good at navigating home. They can find their location back with a precision up to 50 cm. This principle will be used to move the foraging bees to their new hive. The nuc will be moved about 3 meters away from the prime hive. The prime hive must be moved 30 centimeters to the previous location of the nuc. Foraging bees from the nuc, will fly back to the old location from where the nuc was located. The bees will notice the nuc has been moved and will beg it’s way into the new hive. After a couple of days I shift the prime hive to its old place. Followed by putting the nuc back to its intended place a few days later. Swarming will be delayed in the six frame nuc and the prime hive has extra foraging bees, which can be used to increase the honey harvest. A prerequisite for flying of the bees, it must only be done if their is sufficient honey flow and enough space must be available in the prime hives. After the main summer honey flow, flying off must be avoided. Foraging bees can not beg its way into the prime hive if it does not have something to offer. After flying off the bees in the summer honey flow, it only takes around 5 weeks before the nuc is recovered and will prepare itself to swarm again. Prevention of swarming can now be done to take away brood frames with closed brood and give it to the prime hive. Do this with caution because taking away too many brood can unbalance the nuc housekeeping. At the end of the beekeeping season I will move the nuc to a 10 frame brood box. This will strengthen the nuc and more bees are available for coming through the winter. Inspection interval can be limited after the nucs are prepared. Because the prime hive contains a new queen she is likely to swarm. And the nuc is a growing colony which will take a while to swarm. I check the hives every 2 – 3 weeks after the swarms are prepared. The summer honey flow has ended and when the honey has been harvested it is time for the beekeeper to prepare the bees for winter. Hive preparations must be done in advance and all the extra feed must be given before the night temperatures decline below zero. It takes a lot of energy for the bees to process the sugar in cold weather. A feed extract must be prepared, which contains 2 parts sugar and 1 part water. In every hive there should be at least 10 kg of dry sugar available. The bees will cap the sugar when they are done with processing. Be sure the hives are big enough to go into the winter, the hive should have a least 6 frames occupied with bees. Any smaller amount should be combined with a different hive. After the winter preparations the bees will face a long winter. In the week before christmas there is one activity remaining. I treat the bees with oxalic acid against varroa and after that we will wait until april after which the cycle starts all over again. The aalster method is a easy method for beekeeping and it allows the beekeeper to maintain a few hives besides its day job. The beekeeper must strive to a simple and easy way of working. Hive inspections and preparations are just a small part of beekeeping, but for most beekeeping this is the majority of their time they spent with bees. There is not much time needed to do the maintenance of the hive, but do not forget to enjoy the bees. observation is really important because the beekeeper must also have knowledge about the honey flows, within the area. Document your observations and if you have different locations, compare the results. Strive to a uniform simple way of working, and fine tune your methods. Beekeeping is not learned in a few days, it takes patience and ease of mind. The Aalster method works for me, but does not guarantees the same for everyone. Do what works best for you and your bees. And the most important fact is do not forget to have fun! !